This is an extract from Whitehead’s The Underground Railroad, a new novel set in mid-nineteenth century US, when slavery had yet to be abolished. Its subject: the experience of a woman slave escaping from her plantation. 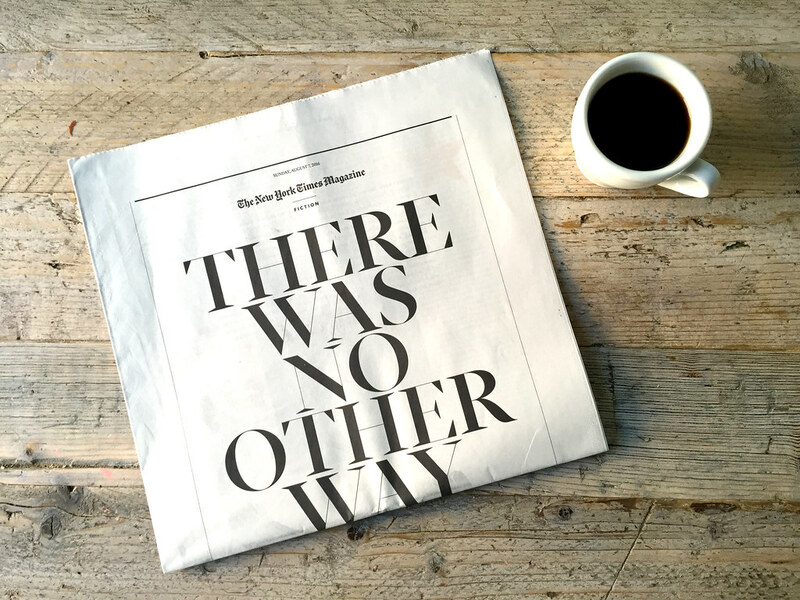 It was printed on the newspaper press like all the other sections of the paper – Home News, Sport, Real Estate, etc. 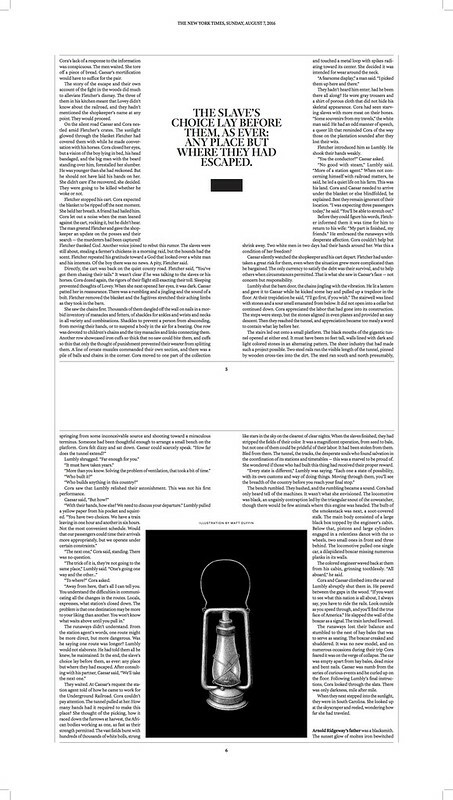 New York Times Magazine fiction section cover, 2016. Design director: Gail Bichler. Art director: Matt Willey. Deputy Art Director: Jason Sfetko. 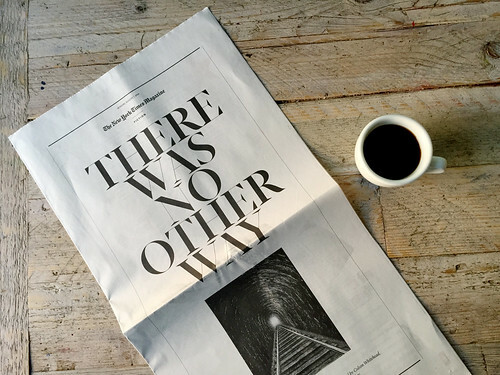 The designers and editors took the bold decision to set the story in an innovative broadsheet format, with monochrome illustrations by Matt Duffin, big chapter numbers and no advertising to interrupt the story’s pace. 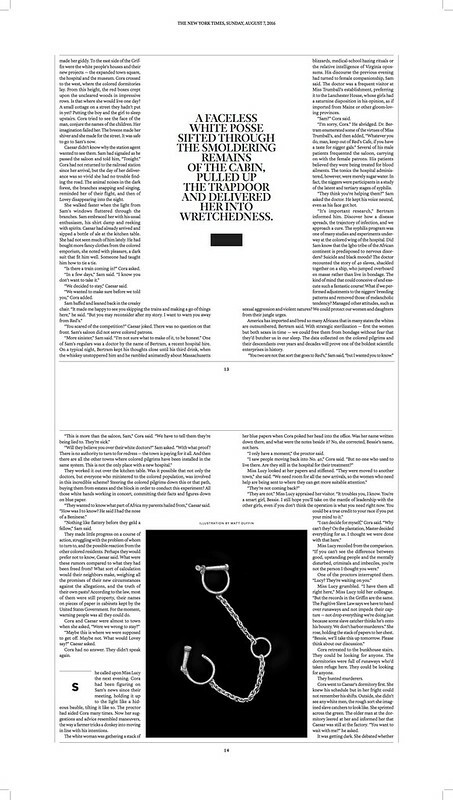 It’s a rare example of magazine designers using the expanse of the newspaper page in a new and an effective way. The Magazine’s design team is on a roll at the moment. 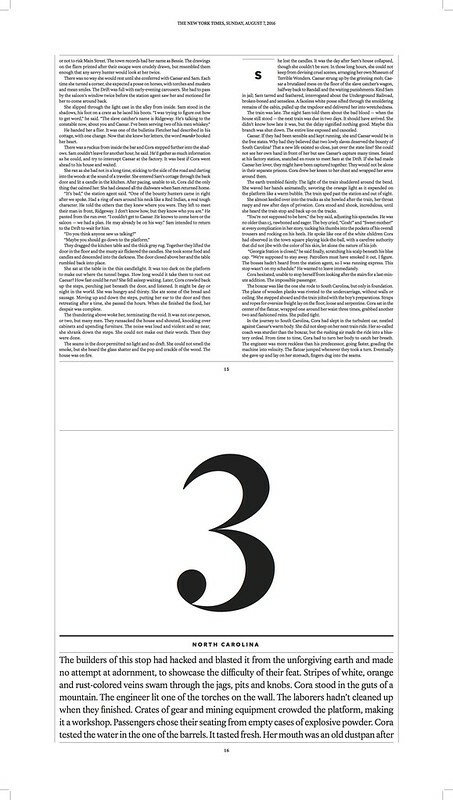 The vertical format of today’s fiction section follows the acclaimed ‘High Life’ edition, made earlier this year, which shows New York from over 800 feet high. 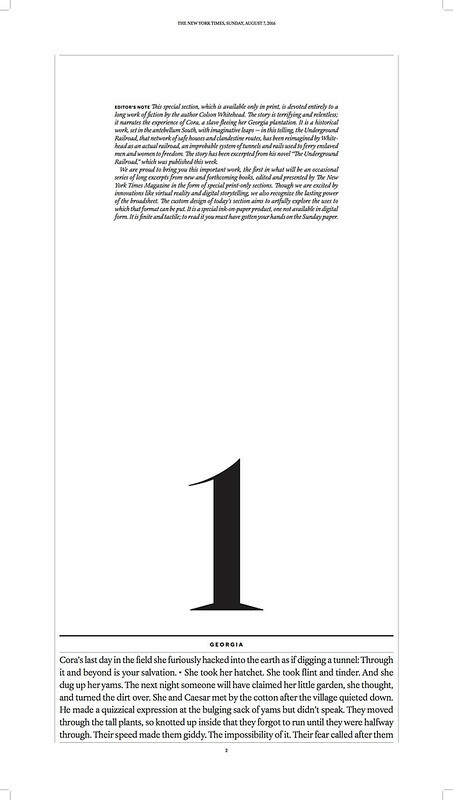 On that occasion, the whole magazine was rotated, skyscraper-like, and most of the advertising clients were persuaded to adapt their artwork to fit the non-standard format. 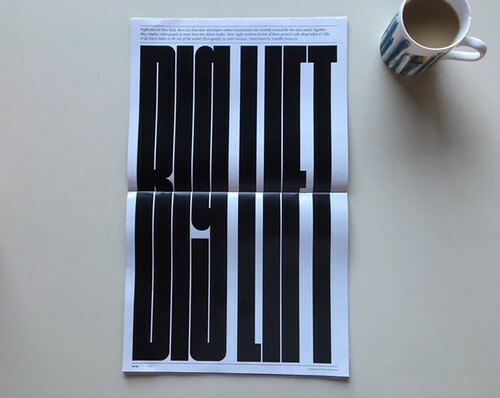 Vertical spread from the ‘High Life’ edition of the New York Times Magazine, 5 June 2016. 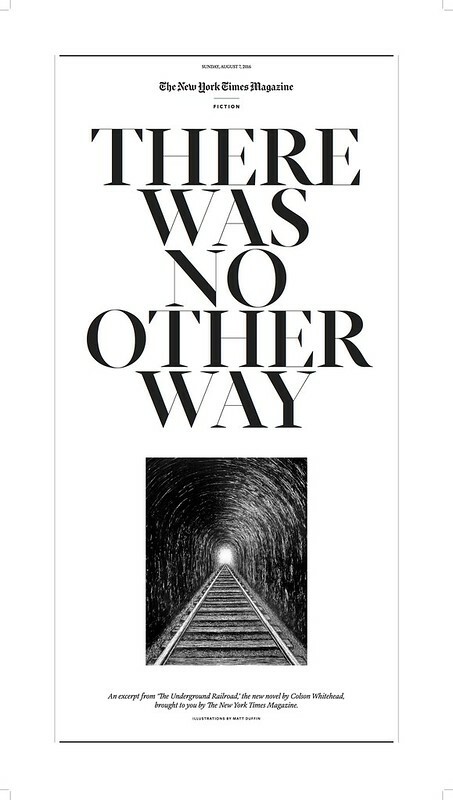 But for ‘There was no other way’ there are no ads, nothing but typography, evocative illustrations and a story worth telling. This is only the first in an occasional series. Silverstein, Bichler and crew promise more long ‘ink-on-paper’ excerpts, ‘finite and tactile’, in the near future. 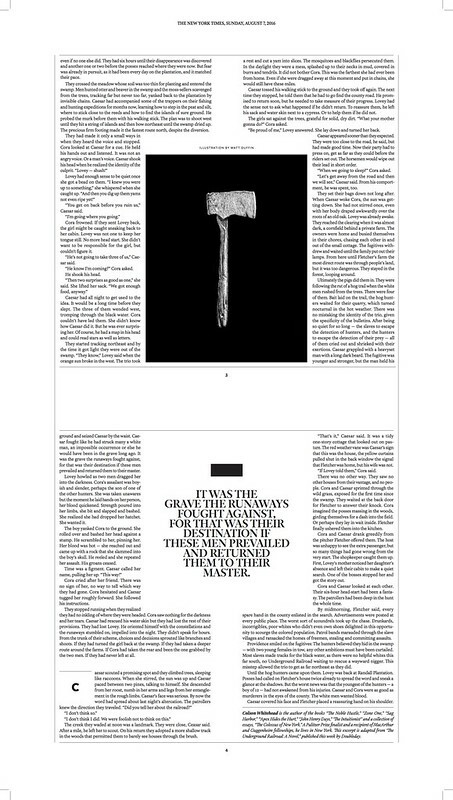 Credits: Author: Colson Whitehead; Editor: Jake Silverstein; Design Director: Gail Bichler; Art Director: Matt Willey; Deputy Art Director: Jason Sfetko; Illustration: Matt Duffin. Photo: Maria Spann. Table and coffee mug: art director’s own.